Dies R Us: Happy Thanksgiving! Happy Turkey Day everyone! Robin here with my design of the week for Dies R Us! It's Thanksgiving Day here in the United States, so I am wishing all of you a "Thankful" day with family and friends! Although I do try to make cards that go together quickly, this is not one of them! I make a few intricate cards for "special" family and friends; you know, the ones who appreciate your work and won't toss them out with the spent ribbon after the holidays, LOL. 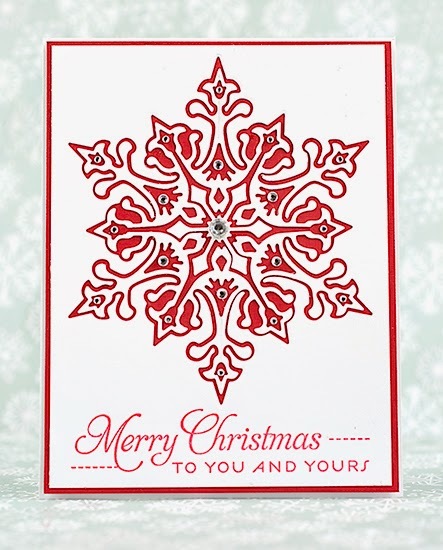 This beautiful snowflake is from Impression Obsession Large Snowflake die set. This die set actually has 4 cutouts for you to put together anyway you like. 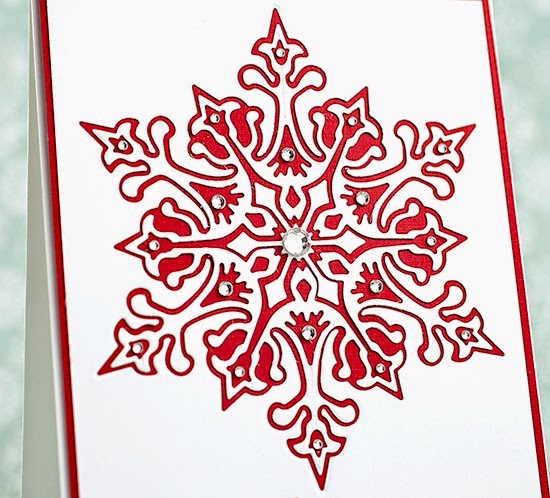 I cut the snowflakes from white card stock; then using the negative space created I adhered the white card to a red card base. 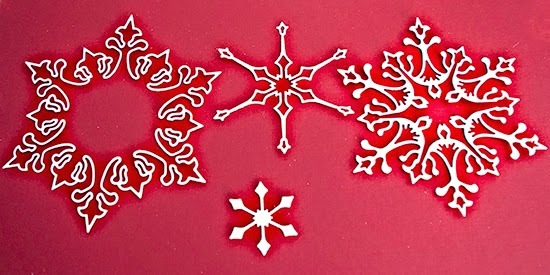 Then came the tedious part, since the snowflake on the far right in the picture above is so intricate, I couldn't use my go to spray adhesive. So I carefully put small dots of glue on half the snowflake, added it to my card and then glued the other half down; it actually wasn't that bad. Would I want to make 48, no, but I am making 12! Then I added the small "flake" to the center and ta da it was done. A note to all, stamp your sentiment FIRST before you put all the work into your card, JUST IN CASE. The card was finished with rhinestones! I only have 11 more to make…no sweat! Have a wonderful day and if the dishes are done, leftovers put up and you have your feet up stop by Dies R Us and shop, shop, shop! Gorgeous! Since I have this one, I appreciate it even more! !